The UKs Official Suppliers of Sahara, Voyager, Monsoon & Stormforce Custom Car Covers of Quality Worldwide. Individually Tailored & Fitted Car Covers for over 5000 different Vehicles. Welcome to Cover Your Car. If you drive a sports car, classic car or something interesting, you've come to the right place for your custom car cover! Here at CoverYourCar, we specialise in indoor, and outdoor waterproof car covers individually tailored for your car, yet at very sensible prices. We achieve these by producing our bespoke car covers in large volume, using high quality materials and many years of expertise tailored to indvidual makes, models and years of cars. More Choice, More Covers, Great Prices! Call us on 01744 633985 for Advice, Sales, Support. 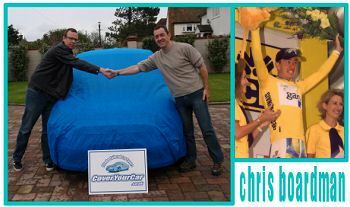 Chris Boardman MBE takes delivery of a CoverYourCar indoor cover. Huge stocks held for immediate worldwide delivery. No need to wait or make do with small / medium / large! Prices are displayed in UK Pounds & Euros. Quality, Fitted Car Covers Worldwide. We are not a Motor Factors or Car Accessory Company who also happen to sell general fit covers in small, medium or large sizes. Behind this website is a team of dedicated professionals, specializing in doing what we do best, that is Supplying Quality, Tailored, Specific Fit Car Covers for more than 5000 different vehicles for over 14 years, we are a UK company you can rely on to be here for you, now and in the future and were the first people to ever sell Stormforce Car Covers. (FACT) so we know what we are talking about. Cielo Our Brand New Custom Fit Outdoor Two Tone Car Covers, bespoke made to order but we do stock popular models. A great price, made right here in the UK for a better fit than any off the shelf cover, Guaranteed! Advan-tex are simply the Ultimate Outdoor Covers and are individually hand made to order in your choice of colour ( Black / Dark Blue / British Racing Green or Grey ) with optional Parking Permit or Front & Rear Numberplate Windows. 2 Year UK Warranty. Stormforce and PLUS Version car covers are made from a unique 4 layer bonded fabric, and is a result of years of research and development to produce a fully waterproof cover that is also breathable. Ideal for newer cars that are stored outdoors and used regularly. All our Stormforce Covers now come with a reformulated outer layer for longer life and high UV resistance. Monsoon Waterproof Car Covers are best for long term outdoor storage during the colder months of the year where buying a totally waterproof car cover is important & paint & chrome need maximum protection. Ideal for cars driven only on weekends or occasionally or for Winter Storage. Voyager and PLUS Version Lightweight Car Covers can be used both indoors and outdoors. Their breathability, water resistance and UV protection make them a favourite choice for daily driven cars & medium term storage, where a totally waterproof car cover is not required. 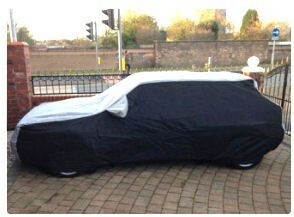 Sahara great value fitted and tailored Car Covers designed for 'in garage' use, both short & long term. Softech covers are our unique range of soft, stretch, fleece, luxury indoor bespoke car covers made individually in your choice of 11 colour combinations to fit your car like a second skin. Now available in Softech Light on selected patterns.